Inkheart sounds like such a great book. The Scholastic one that I think sounds interesting is: The Midnight Library #1: Voices. Let's see...another book I'd like to read would be Skeleton Creek. The format sounds awesome and I've heard good things about the story in general. Oh, and the Diary of a Wimpy Kid series too. They sound funny!!! I'm already a follower, if that counts? I think my husband and I would both greatly enjoy Inkheart. My daughter is only 3 months old though so I'm thinking The Real Mother Goose is more her speed - plus I think the one on the Scholastic site is the same one I had as a child! I really like the Black Lagoon Adventures: The Field Day From the Black Lagoon. I've been wanting to read this, so please toss my name in the pot. Thanks! As for another book by Scholastic that I think sounds great, I'd have to say that the 39 Clues series sounds good. I've heard really good thing about it from the librarian at my daughter's school. The How I Survived Middle School Series looks really interesting. My daughter enjoyed this (from library) but I'd love to own it and I want to read it myself. Tales of Famous Americans please. The Scholastic Encyclopedia of the Presidents and Their Times would be a great book to own! I honestly don't do to well with history so this would help me just as much as my children. My son has been asking lots of question regarding past presidents so Scholastic Encyclopedia of the Presidents and Their Times would be a very good source of information. Griffin's Castle looks like a book my daughter might enjoy. I would like to have Can You See What I See, Trucks and Cars, for my little boy. I would love to own the Judy Blume complete set of Fudge books. I loved reading about Fudge when I was growing up. It would be perfect to read with my daughter when she gets older. I now subscribe to your feed on Google Reader. Encyclopedia of presidents would be interesting! Thanks for entering me. My son would love The Night Pirates. I love Schoolastic books. Thanks! We'd love the 39 Clues books. I've seen them before and debated them. any of the I SPy my son loves these! Inkheart looks like a great read! I think my son would like "Bone: Out From Boneville"
I follow you on twitter, and I tweeted (AtHomeWithBooks). I subscribed to your blog via rss feed. I think my niece would like Airhead! The book called Rules looks like a good one! I like the Diary of a Wimpy Kid series. I'll read it to my daughter. the diary of a wimpy kid sounds cute. I followed you in blogger and Twitter! I did a Tweet of this page. I'd be interested in Sweet Dreams: A Bedtime Storybook Collection for my granddaughter. Well this is going to sound silly but I would love to get The Dumb Bunnies collection for my son. He read every one when he was little but they were borrowed from the library. I'd love to have that set for him to pass on to his children someday. In the future. A long time. I'm a blog follower now! The Little Scholastic:The Crawly Caterpillar looks like a fun book. We love the I Spy books -- I've been interested in Inkheart since seeing movie previews. Harry Potter and the Deathly Hallows. we have all the other books so this would be a good one to choose. the peter rabbit collection. or maybe a series of unfortunate events. both for myself. A Box of Unfortunate Events: The Dilemma Deepens - we like lemony snicket! My daughter just got the Rainbow Fairy boxed set for Christmas. Of course, what is there not to like from Scholastic! Noodles The Puppy (Scholastic Reader Level 1) looks adorable. I love the Dora the Explorer Phonics Boxed Set #1. Reason being, my daughter loves Dora, and it is educational as well! The Encyclopedia of Immaturity looks funny. I'll bet myself and the kids would enjoy reading it. To be honest, InkHeart is the book I would get - the movie looks so good (from the previews I have seen) and I would love to read it. Quick Draw Flip Books sounds fun! The Boys Book of Survival looks interesting. My oldest son (who is 8) and his friends would probably enjoy this book. They are always outside having adventures and the book tells how to make maps, track animals, etc. I think Wizardology: The Book of the Secrets of Merlin sounds pretty cool! Great giveaway! I love Scholastic, the Sisters Grimm Series #2:The Unusual Suspects interests me. My daughter has the first one, adorable series! The Hunger Games...I've been wanting to read that for a while. I've been wanting to get my hands on the Tales of Beedle the Bard to complete our HP collection. Thanks! When She Was Good sounds like a book I would enjoy. I LOVE the Rainbow Fairy books ;0) And I really want to read Inkheart before I see the movie.. I would like to read A Curse Dark as Gold. Inkheart sounds really good too! The Keys to the Kingdom Book #1: Mister Monday looks like it might be the start to a good series. Te Quiero: Cuatro cuentos para compartir. It looks like a sweet little book perfect fr reading at bedtime. 666: The Number of The Beast looks good. I love hoprror stories. A Parent's Guide To Reading With Your Young Child. We really like Dragon Rider and Eragon. Had fun reading parts of these with my son (now in 5th grade). My grandson is really into dinosaurs so I would have to say the Dinosaur Cove #1: Tyrannosaurus Rex Attack! Junie B. Jones's First Boxed Set Ever! would probably interest my daughter! We're very interested in the 39 Clues! Looks good. I loved Harold and the Purple Crayon! My son would love it too! Since my daughter is in kindergarten the book Getting Ready for 1st Grade sounds like it would be great. I love the Froggy books. We're big fans of The Magic Treehouse here so any of those box sets would be much loved! I love the Little Scholastic: Good Night, Sleep Tight board book (my daughter is 9 months). :-) I can't believe I haven't read this yet - thanks for the giveaway! My son would love The Scholastic Encyclopedia of the Presidents and Their Times...he is obsessed with presidents right now! My daughter has been wanting to read Inkheart..so this would be great to win it for her..thanks! My daughter would love Getting to Know the U.S. Presidents: Theodore Roosevelt. She goes to Theodore Roosevelt elmentary and is always asking me questions about him. Plus I always love learning about historical figures. The Star Wars Boxed Set Episodes I-VI would be our choice. And I have definitely bookmarked as a future surprise for my son who is an avid fan. "The 39 Clues" looks interesting. I SPY is a family favorite. The Hunger Games looks like a really good read. "The Midnight Library #5: Liar" looks good. Another book that interests me is Airhead by Meg Cabot. Thanks. Sipping Spiders Through A Straw - need I say more? What I saw and How I lied looks really good! I am a HUGE fan of Scholastic! My favorites are the Harry Potter books, but I really love them all! We both would like to read inkheart! The Scholastic Encyclopedia of the Presidents and Their Times would be my choice. The Invention of Hugo Cabret looks really good! I had forgotten about Scholastic books - they are wonderful. 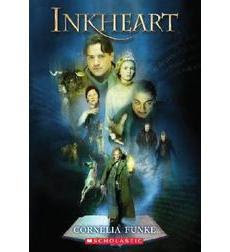 I just saw Inkheart in the theater yesterday - it was wonderful! I love the look of the Noodles the Puppy books. I have a beginner reader and she would love these! I want Harry Potter and the Deathly Hallows. This would be fabulous to win. The encyclopedia book of presidents would be great. thank you! The Dark Is Rising Boxed Set looks interesting. Even though I've already read them, I don't have all the Harry Potter books - I'd really like them all in hardback. I do, though, also really want to read Inkheart - I've heard such great things about it! The Littlest Pet Shop: Sweetest Easter Ever! activity book looks cute. Thanks. Would like nice hardcovers of Harry Potter also. We'd love to read Eragon together as a family! Thanks for the fun contest! Inkspell by Cornelia Funke interests us! We're currently reading Inkheart and loving it (would love to have a copy to add to our home library). DH's 6th graders would LOVe this book! Thanks for the giveaway! I would like to have my grand daughter Kristin read The Girl With the Broken Wing, in the 9 and over section. The quick draw flip books book would be really neat to have. "Lullaby and Goodnight" would be a good book for my son and granddaughters. Thanks! Encyclopedia of Presidents is really cool. My husband loves teaching our son about presidents and history. Thanks for the great giveaway! I liked the Klutz Build A Book....does that count?? Thanks! I remember Roll of Thunder, Hear My Cry from when I was a kid and it is a fantastic book. I would love to have Read to Your Bunny Very First Library Set for my girl! Thanks for the giveaway! My nephew has been asking for this book! He is such an avid reader that his teachers keep having a hard time keeping up with him. I think he would also really like Artemis Fowl: The Lost Colony. Thanks! I'd pick Artemis Fowl, looks interesting! I would love to have my son reading The 39 Clues. Sounds like a fun book! Diary of a Wimpy Kid looks really cute. Slightly reminds me of myself! My daughter loves the goosebumps. Thanks for the chance to win the book. The Rachel Ray Yum-o! The Family Cookbook would be a good selection. Thanks. I'm excited to see this movie, and would love to read the book because books are always better. Since I am a child Book Orders, I love Scholastic! Another item I'm interested in is the world of Lois Lowry. I've read the Giver but not the other two and would love to. Thanks. I like Not A Box by Antoinette Portis! I am also interested in reading The Invention of Hugo Cabret. The Little Scholastic: My First Jumbo Book of Dinosaurs looks like fun! The Cry of the Icemark looks like a very interesting book. Thanks! Inkheart sounds scary. I love thrillers and goosebumbs when reading. I think I'd like to read Millie and Macy's Parade to my granddaughter. Keeping my fingers crossed that I win your wonderful drawing for Inkheart. Lush by Natasha Friend . Thanks for the giveaway. The Girl's Book of Glamour looks like something else I would like to read! Any (and all) I-Spy books interest my kids. I've actually been wanting to read Inkheart for myself. Airhead by Meg Cabot. I would love to win Inkheart for my daughter! i would get the dinosaur cove book for my son. He is just starting to read and this would be right up his alley. My nephew would love reading Indiana Jones and the Last Crusade. Knut the baby polar bear--for my grandson! Tag reading system and Rainbow Magic Books 1-7 sound good for my niece and nephew. Thank you for the giveaway. The Land of Elyon Book 1: The Dark Hills Divide by. Patrick Carman looks interesting! Inkheart sounds like such a good read or should I say ghoul read?! I've heard about the "Surival Book for Boys" before and looking at it, I bet it is good!